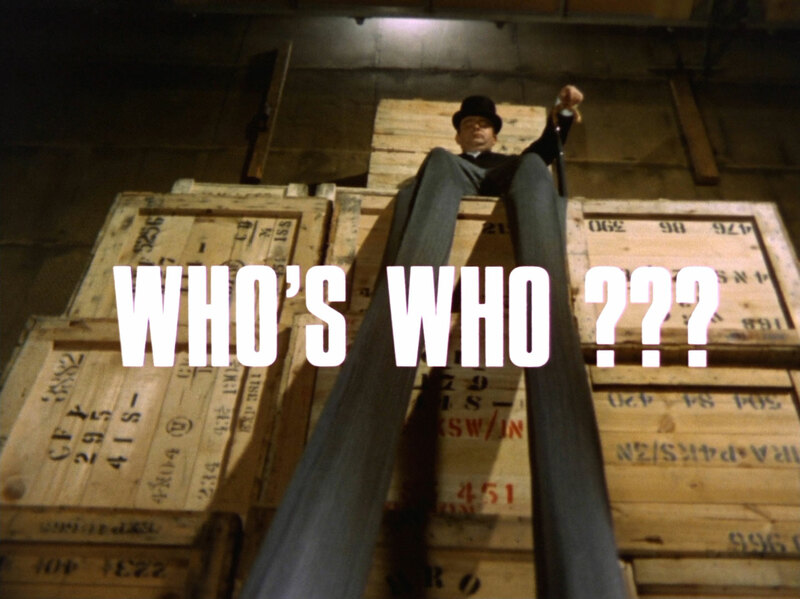 The Avengers : Series 5 : Who's Who??? 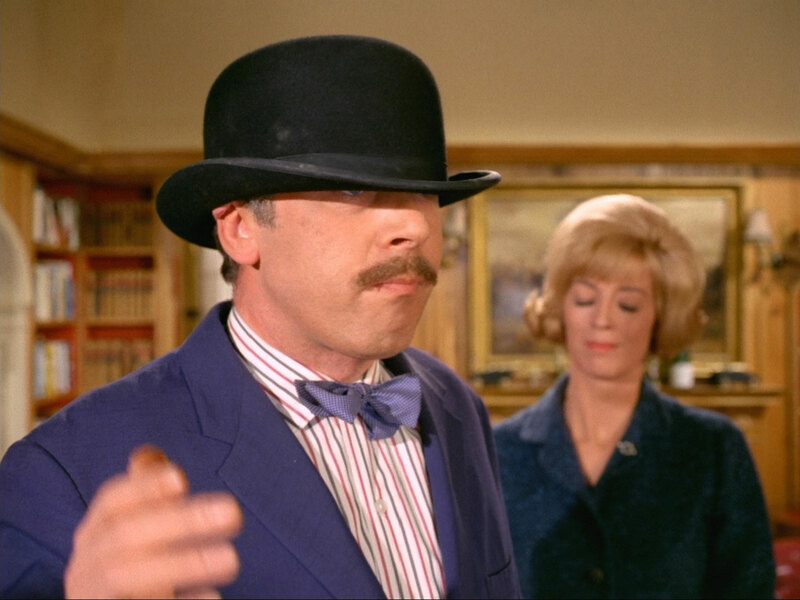 A dapper city gent wearing a rose - Hooper (Malcolm Taylor) - enters a warehouse, expecting to meet Steed but is murdered by two enemy agents, Basil and Lola (Freddie Jones and Patricia Haines). They put the body at the top of a pair of stilts, and put a revolver at the base, with the rose in the barrel. "If that doesn't brings Steed and Mrs Peel", says Basil, "nothing will". 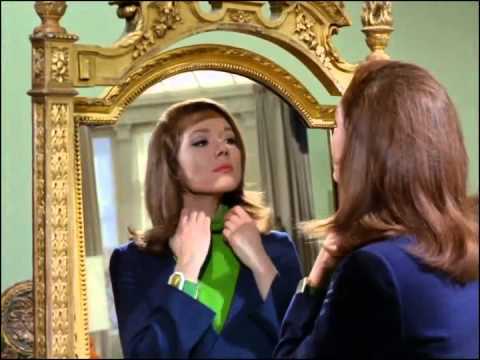 Mrs Peel primps her hair, getting ready to go out when Steed appears in her cheval mirror, saying "Mrs Peel, we're needed". 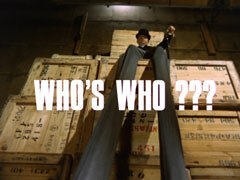 They visit the warehouse where Steed explains Hooper was one of Major B's agents, his codename - "rose". 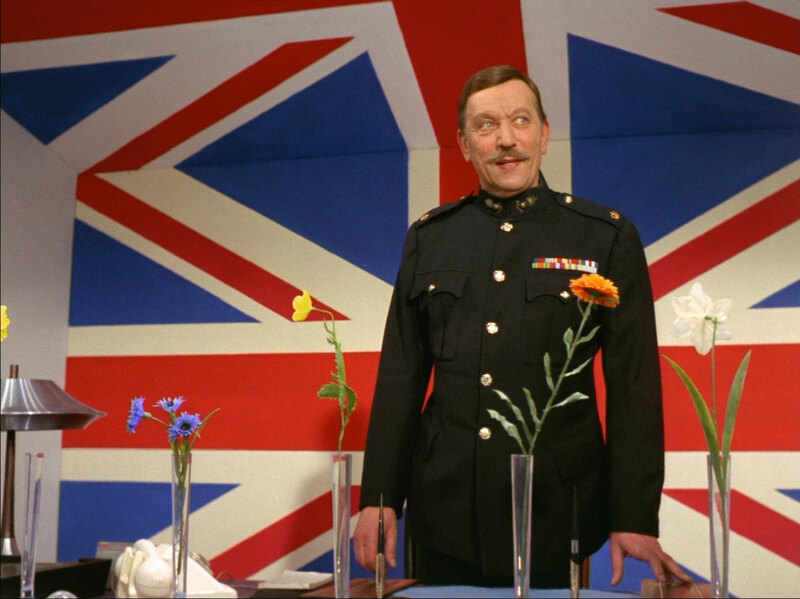 Major B doesn't like the idea of spies and prefers a bouquet of agents. 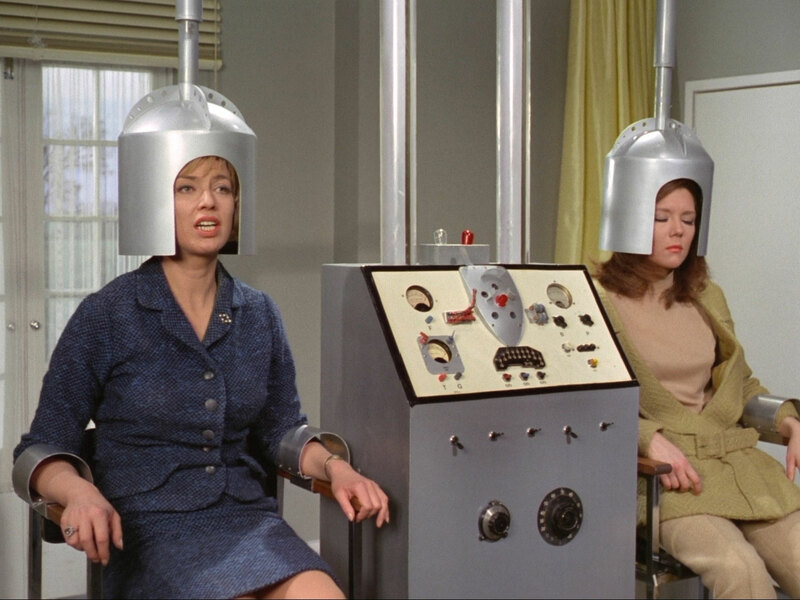 Basil and Lola, menawhile, are being shown film of Emma and Steed by Dr Krelmar (Arnold Diamond) and they plan a trap at the shop that sells the stilts, Hi-Limba Products Ltd. Krelmar unveils a complex piece of machinery with two seats, then Basil suddenly has a migraine. Krelmar gives him some pills for it, and they hear Steed arrive in the Bentley. He enters and asks Lola about the stilts and is knock out by Basil hitting him with one. Steed is	dumped into one of the machine's seats and Basil sits in the other; Krelmar explains he has perfected a machine for harnessing the occassional sense of detachment all people feel to enable him to transfer minds between bodies "we experimented in the war, we had unlimited guinea pigs". Basil starts counting as Krelmar turns the knobs and switches, and Steed finishes the count. He gets up and kisses Lola - it's Basil! He bites the end off a cigar and says, "Now for Mrs Peel". Emma reproves Steed for slouching, "I thought you'd done your homework." (depsite herself chewing gum and drinking beer) and they antagonise each other by highlighting their new selves' best features. Meanwhile, Emma is still refusing to believe Steed is who he says he is, despite the evidence of a mirror showing they have both altered. Steed proves his credentials by recalling a drive from Montbert to Dijon, and the charming chateau they discovered when she made a wrong turn and she concedes and says, "I wonder what we're up to." Steed and Emma visit Major B (Campbell Singer), saying they fear an attack on the Floral network and request the agents' 'phone numbers. Emma hurriedly hides the gum she's chewing under the Major's desk when Tulip (Peter Reynolds) enters with the contact details, puzzling the Major, who gets sticky fingers from it after they've left. Steed and Emma escape by a combination of her karate kick of the beam their cuffed to and his skill in cracking the cuffs. She finally believes he really is Steed when he can start the Bentley easily. They set off to find 'themselves' and Krelmar, Emma suggests they check her apartment, but the villains are at Steed's flat, and summon Daffodil (Philip Levene) who is shot by Steed, Emma covering the sound with loud pop music. Steed drives them to his flat instead of Emma's, but is spotted by the villains who let his checkup 'phone call go unanswered and quickly call the Major. The real Steed and Emma enter the aprtment and are apprehended by their switched selves, who hand them over to Tulip when he bursts in with his men. Major B is baffled by their insistence on their story of body swapping, even when they know about his cricketing prowess and toupé: "I'm head of intelligence, do you take me for a perfect idiot?" "No one's perfect", says Mrs Peel. Poppy is killed by Steed and Steed and Emma escape by overpowering Major B after he comes back in from conferring with Tulip. Marigold is the next to be killed, then the Major warns Steed of the escape. They decide on a new HQ and so Steed and Emma go to 'her' flat, Tulip remaining on watch outside Steed's place. Steed and Emma break into his apartment and Steed is apalled at the squalor of his flat, the consumption of all his 1947 champagne and cigars with bitten ends. They find the dead agents - six of them now - and try to warn the next, Bluebell, but he too is gunned down. Emma guesses their 'selves' are at her flat, which a 'phone call confirms, and they leave, but run right into Tulip and have to escape out the back. Tulip follows, but calls the Major when he spots the bodies, telling him the enemy agents are assassins. He pursues them in his car but they give him the slip in the suburbs. Steed decides he and Emma would be better off taking up permanent residence and calls the Major, telling him to shoot the 'enemy agents' on sight. Just then, the real Steed suffers one of Basil's migraines and finds the pills, with Krelmar's address on them, in his jacket pocket and they head off to secure the machine before it can be destroyed. At about the same time, Steed realises he hasn't had any headaches and realises the real Steed has the pill bottle. He sends Emma to destroy it when Krelmar fails to answer the 'phone. The real Steed and Mrs Peel arrive just before her and knock her out. Steed can't work out how to transfer Mrs Peel back into her own body and goes in search of instructions, but is clubbed by Krelmar. 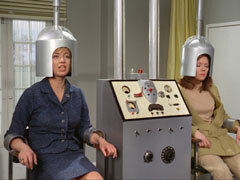 Mrs Peel tricks him into switching her back into her own body and knocks him out, dumping him in a cupboard. Steed comes back in and is wary of her until she demonstrates her karate on him and whispers something saucily intimate in his ear. She returns to her flat, pretending to be Lola, and gets Steed to accompany her back to Krelmar's house. Tulip meanwhile has caught up to Steed and, seeing him interrogating Lola through the window, calls for reinforcements. 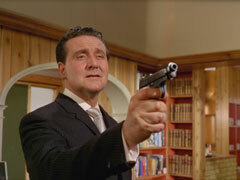 He bursts in to arrest Steed and is easily dispatched. 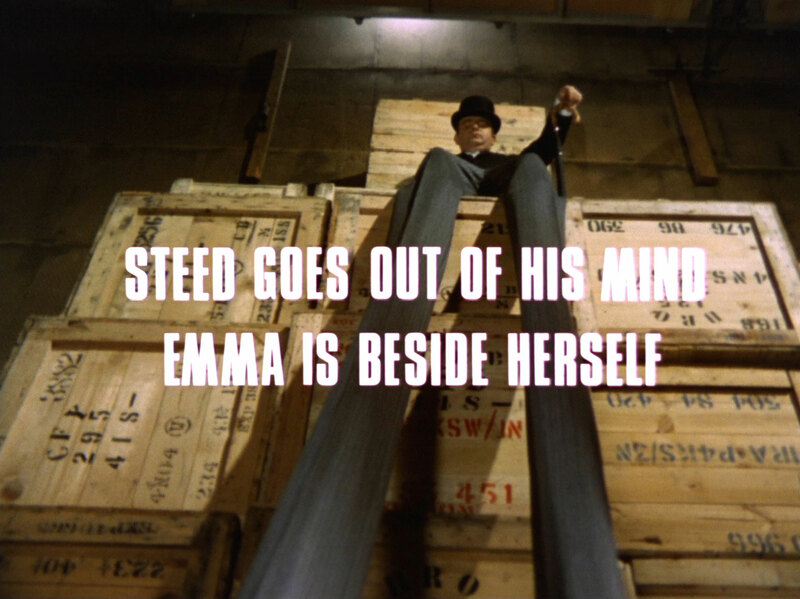 Emma returns but makes Steed suspicious when she calls him 'Steed' and doesn't know his real name. He shoots her in the back - but the clip has been emptied by Emma and she attacks, hurling him through the door into the lab. Steed and Steed fight and Emma helps him defeat err.. himself.. and she hurriedly switches Steed back to his own body before Major B and his men can break into the room. 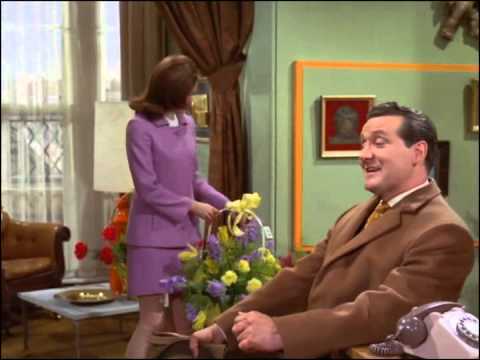 Steed arrives at Emma's flat to find it festooned with flowers - "Don't tell me they got the whole network!" - she grumpily tells him they're from the grateful surviving agents, in honour of a special occasion and he pretends to have forgotten it's her birthday, suggesting obscure festivals as the reason, and then produces tickets for a surprise weekend in Paris... but finds that Emma has already packed. "One should never take a man for granted, but one does. Come along, Basil baby!" "Coming, honey child", grins Steed.